Lipids, or natural protective oils, are essential for maintaining the integrity of all living matter due to their ability to form a barrier between the living cell and the outside world. In human skin, lipids are used as building blocks for membranes and fulfill specific functions such as preventing extreme dryness by forming a barrier and preventing evaporation of water. More specifically, the outermost layer of the epidermis, the stratum corneum (SC), constitutes the main barrier to the movement of substances into and out of the skin; it consists of corneocytes (SC cells) and several different types of lipids, such as ceramides, sterols and free fatty acids. These lipids that make up the barrier lipid layer of the stratum corneum are expelled from cells during the process of keratinisation in the epidermis. When the barrier lipid layer is disturbed, this can lead to pathological diseases such as ichthyosis, psoriasis or atopic dermatitis. Ageing also has an effect on the composition of SC lipids. Studies have shown a decline in ceramide and sterol components with an increase in fatty acid composition in aged skin. 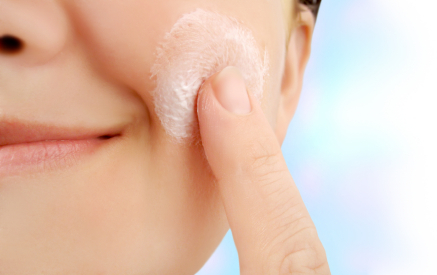 Seasonal changes have also been shown to impact SC barrier lipids which leads to dryness, roughness and increased trans-epidermal water loss (TEWL) while a reduction in ceramides generally leads to an increase in skin sensitivity and irritability. Likewise, diet and the products we apply to our skin can impact the barrier lipids. Alcohol, acetone, harsh surfactants, AHAs, BHAs and retinoids can strip lipids giving that taut skin feeling which is often associated with increased dehydration, wrinkles, sensitivity and premature ageing. 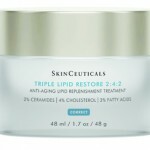 Unfortunately, nothing good results from having a compromised lipid barrier layer.Triple lipid restore by Skinceuticals is an appealing formula that helps replenish those critical lipids to the epidermis. The most important property of lipids in skin care is their ability to restore the barrier lipid, promote moisturisation, smooth skin texture as well as, a visual reduction of the signs of dryness. Restoring the barrier lipids not only inhibits TEWL, it helps keep the natural moisturising factor (NMF) inside the cells where it is needed to keep cells hydrated and enzymes functioning normally. Fortunately, when we are young our skin can restore its natural barrier lipids after an insult such as exposure to alcohol, soap or chemical peels. The time required for barrier lipid recovery varies according to age; in young individuals 50-60% of the barrier lipids are restored within 12 hours with full recovery taking about three days. However, in older adults complete recovery can take over a week. Depending on the condition of the skin this can lead to dehydration and additional sensitisation. The most obvious possibility for recovering the skin barrier function is by replacing the intercellular lipids in between our keratinocyte cells. Harnessing the power of phytoactive ingredients is one of the best ways to restore a compromised skin barrier to replace intercellular lipids that have been depleted from ageing, environment, and the many other factors.